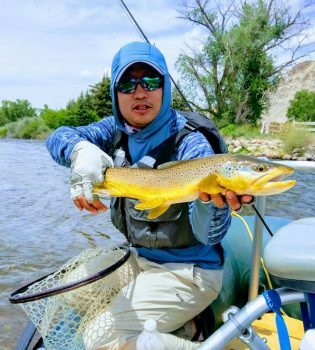 See what our clients have to say about their exprience with Trouts! It is easy for us to sit here and tell you how great of a job we are doing. However, we can not make up what our customers have to say about their experiences with us on any of our Guided Fly Fishing Trips. We take great pride in providing a professional and memorable experience on every guide trip. We also promote our customers to leave feedback. If you take a look at our reviews we are confident you will like what you see. Whether it is an Orvis Review, Google Review or Trip Advisor our customers continue to speak very highly of us. My review is regarding my float trip with Tim Suplee out of the Frisco shop. 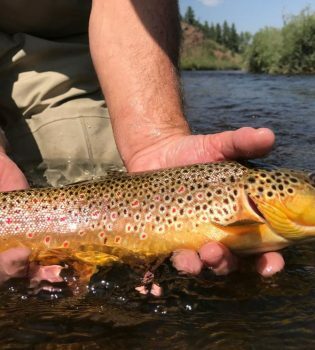 The conditions of the local rivers weren't great due to run-off, but Tim had a few suggestions and recommendations to make for a great day. Immediately, Tim seemed like a really great guide. He asked me several questions, on the drive to the Eagle River, and analyzed the type of experience I was looking for. Understanding that there are many skill levels out there, I really appreciated that he took the time to assess what I was looking for. Tim was professional and a super, down-to-earth, guy. I highly recommend him for a guided trip. I'd say the trip was successful, wouldn't you? These are just pictures of the larger fish -- we lost count after a while. Thanks Tim! It's my second time fishing with Trouts (both times out of their Frisco shop) and I'll be going back again. They have a great lineup of guides for every experience level and they're shop is always knowledgeable and friendly. I've fished with Zeke Hersh both times and he's one of the best in the area. His knowledge of the rivers in the area really helps when picking a spot to put in or finding an alternative when the weather starts to turn bad. His patience and ability to teach is outstanding and really helps a first-time angler like my fiance get into the sport and catch her first trout. It's also helpful that I have learned something new about technique, flies to fish during certain times, or stretches of river that I've not been to yet each time I go with him. 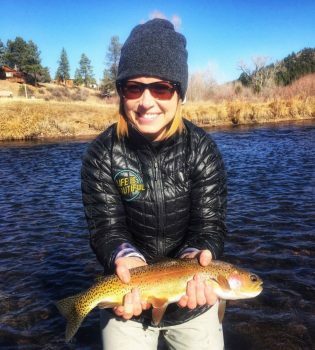 My husband and I booked a fly fishing guide for our quick weekend getaway to Denver. We met Mitchell and Tippet around 8am, and drove through Pike National Forest to get to our fishing hole. We suited up, everything fit perfectly, and we head out towards the spot he had in mind. The whole day was an absolute blast. Mitchell was knowledgeable, fast, efficient, and so patient, with me especially. I️ had never fly fished before, and for my husband it had been years. He explained everything but never dumbed it down, he told me how to do everything, and allowed me to try, fail, and ultimately succeed. I caught two beautiful fish, my husband caught one (), we laughed and splashed alongside Tippet, his pup, who was a joy to have on our adventure. He made us a delicious lunch, and we left feeling completely satisfied, and excited to do it again. Can’t recommend enough!